Casino Elegance, commonly known as Elegance, is an online gaming site owned and established by the Betclic Everest Group Casinos in 1997. It is one of the oldest members of the Online Gaming Alliance (OGA) which was founded on that time to promote ethical business practices and exceptional gaming excellence in the gaming and betting industry. The site is duly registered and licensed under the government of Gibraltar which prohibits its offered games to several countries such as the USA. The site is powered and developed by several software developers which include Electracade, Everest Gaming, Blueprint Gaming, Playtech, Cryptologic (WagerLogic), and the renowned Grand Virtual software. These providers supply the site with conventional slot machine games, interactive video slots, and popular casino game categories such as table and card games, video pokers, roulettes, specialty games, and a lot more. It prioritizes its development on its slot machine games to attract more online players and betters. They provide high quality machines with exceptional graphics and video features. Some of the famous game titles featured on this site are Pinball, Quixote's Dream, Rock Star 50, Shopping Spree, Zuma, Star Signs, Space Ace 100, Tops & Bottoms, Tsar's Gold, Winning Goal, The Genie's Secret Treasure, World Tour 50 and 500, Zombie Harvest, and many more. 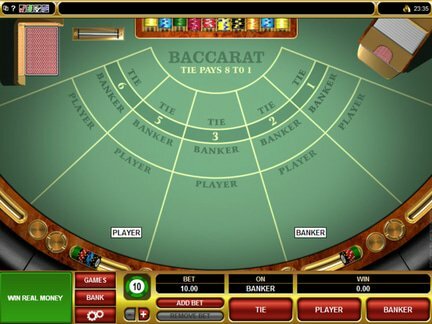 It offers also conventional table and card games such as different blackjack variants like Double Deck, Las Vegas, Super Play 21, 6-Deck, Barcelona 21, Classic, and European; as well as different roulette games, red dog, baccarat, Caribbean Stud Poker, and a lot more. They also have unique variants of their video poker games which range from one-hand to multi-hand gameplays. Players also have the chance to win progressive jackpots, bonuses, and unique wild cards from these video poker variants. 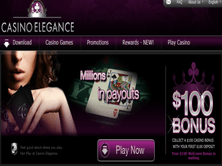 Casino Elegance also offers bonuses and promotions to its players. Some of these include the usual 100% sign-up bonus for their new player which amounts up to $100. Compared with other welcome bonuses offered by other gaming sites, Elegance's sign-up bonus remains on the player's account after every winning withdrawal which can be used again on other games. The site also offers monthly incentive, wagering rewards, and extra game bonuses. However, several casino review sites have reported that the company has been closed down and is no longer active on the gaming industry. There are also reports that the site is transferred and is changed into Casino Everest. Since then, no complaints or bad reviews were made against the site. Nevertheless, Elegance upholds its general service to serve its players with realistic and interactive casino games, as well as its players' convenience to access their records and accounts on the said site - which earns them a 4 out of 5 rating for these exceptional site features.